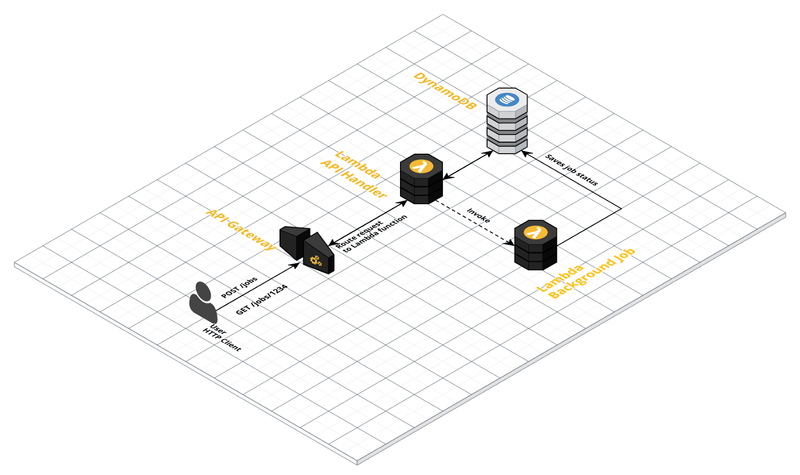 The serverless way to deploy web applications in AWS usually involves hooking up API Gateway with Lambda. If you done this, chances are you have ran into a built-in constraint: the timeout. These products are designed to run microservices, which are expected to be micro, duration-wise as well 😆. However, there are some use cases for which our web app needs to handle long runnings tasks. In this article, I will share with you an HTTP pattern to accomplish that while still being serverless. First things first. Lambda functions will timeout after a max. of 5 min; API Gateway requests will timeout after 29 sec. Find out more about service limits: Lambda and API Gateway. We want to respond to the request quickly and perform the long running task on the background. Simple, right ? This is also called Asynchronous processing. Let’s it break it down into three parts: i) initial request/response; ii) background processing; iii) polling. You might be wondering where we will execute the long running job. We want to be serverless, so let’s use another Lambda function. As mentioned in the last step, this function will be called asynchronously, detached from the original Lambda. That means, we can now take advantage of the full 5 min Lambda timeout. That time should be enough for us to execute our long running task. Once processing is completed, the function must update the status of Job in the database. Something like my_job.status = 'DONE'. Clients should send requests with care so not to overload the server with too many requests. A good strategy is to perform polls with Exponential Backoff. Post on the comments section below if have any questions. Liked it ? Share this with your friends. And give it a Clap to help spread the word.